Use Color Gradation to Make a Stunning Swarovski Crystal Pearl Necklace! Happy Summer Beading Friends! Leah here with another project from Eureka Crystal Beads. Today I’m going to lay out 7 lovely colors of Swarovski Crystal Pearls to show you how to use color gradation to make a stunning, yet simple, summer pearl necklace. (8 each) 6mm Swarovski Crystal Pearls in the following colors: LAVENDER, POWDER ROSE, PASTEL ROSE, ROSE PEACH, CREAM ROSE, and IVORY. Toho Size 11 Starlight Galvanized Permafinish Round Seed Beads #PF557 (1) seed bead in between each pearl, or more if desired for different additional spacing. (16) for the clasp area. The number of Swarovski Crystal Pearls you’ll need will depend on how long you want your necklace to be. The amounts above in the materials list are what was used to create the pictured necklace, which totals 17.5″ in length. You can also use additional seed beads at the back for additional length, or add 2-3 seed beads in between each Swarovski Crystal Pearl instead of the 1 seed bead that I used. You’ll start by laying out your beads to be used. 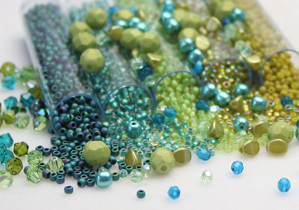 This will include some of each of your Swarovski Crystal Pearl colors as well as your Toho size 11 seed beads. Use a piece of Soft Flex beading wire that is cut to the length you would like your finished necklace to be, plus an additional 4-5″ so you have plenty to work with in order to fasten on your clasp. String 7 of your MAUVE Swarovski Crystal Pearls to the center of your Soft Flex, using a Toho size 11 seed bead in between each one. You’ll now continue to build up your length from the center of your necklace, working up each side. You’ll add 4 beads in each color to each side, spacing with a single seed bead. (Or more if you’d like!) You want both sides of your necklace to mirror each other. ***The order in which to add your Swarovski Crystal Pearls is the same order used to list them in the materials list above. You’ve started in the center with MAUVE and you’ll finish at the back of your necklace with the last color listed, which is IVORY. Once all of your beads are strung, end each side with: (1) 2x2mm Crimp Bead Tube, (4) Toho Size 11 seed beads, string through the loop of your clasp, and (4) more seed beads. Now, you’ll string your wire back through your crimp bead and, if the pearl will allow, that as well. Push the crimp bead snug up to the seed beads and you’ll see how a small beaded loop is formed. Using seed beads here for this additional detail is certainly optional, but I think it adds the perfect finishing touch. After you load the components for the 2nd side and you’ve strung back through the crimp bead, make sure to pull your Soft Flex beading wire snug so there is no slack in the necklace. Pull in the direction towards your necklace to get your design tight. Use your Beadsmith Crimper tool and it’s 2-step crimping process to secure your clasp. If you’ve never used a crimper tool before, check out my blog Back to Basics: Crimping! for an easy-to-follow tutorial or a refresher, if needed! You’ll now be left with a stunning twist on a classic pearl necklace created with affordable (yet fabulous quality) Swarovski Crystal Pearls! Please check out our selection over at Eureka Crystal Beads to see the rainbow of colors that are available to make this necklace in endless combinations! Until next time, Bead Happy! Previous Post JULY BIRTHSTONE: THE STUNNING RUBY! Next Post Jewelry Design Ideas: Bead Caps!